With cobalt prices soaring and ethical questions about artisanal mining continuing, Panasonic has announced that it is in the process of developing cobalt-free EV batteries. Panasonic, the world’s largest automotive lithium-ion battery manufacturer and Tesla’s exclusive battery cell supplier for the Model 3 sedan, produces the cells at the joint Gigafactory 1 in Nevada. Cobalt material is commonly used in the production of rechargeable batteries for a wide range of consumer electronics devices, stationary energy storage units, and electric vehicles. The cathode materials of batteries typically contain the rare metal cobalt, such as in the form of lithium cobalt oxide (LiCoO2). Several reasons contribute to the movement away from cobalt content in lithium-ion batteries. Prices of the mineral have multiplied over recent years. Cobalt, which is typically combined with nickel and manganese in electric-car batteries, is relatively scarce. Elsa Olivetti of MIT suggests, “Without proper planning, there could be short-term bottlenecks in the supplies of some metals, particularly lithium and cobalt, that could cause temporary slowdowns in production.” A new report by the Helmholtz Institute Ulm (HIU) in Germany suggests that worldwide supplies of lithium and cobalt will become critical by 2050. And there’s also the difficulty of cobalt’s most abundant location. Most of the world’s cobalt is mined in the Democratic Republic of the Congo (DRC), which is known for corruption and human rights violations, including its cobalt “artisanal miners,” who are often children. 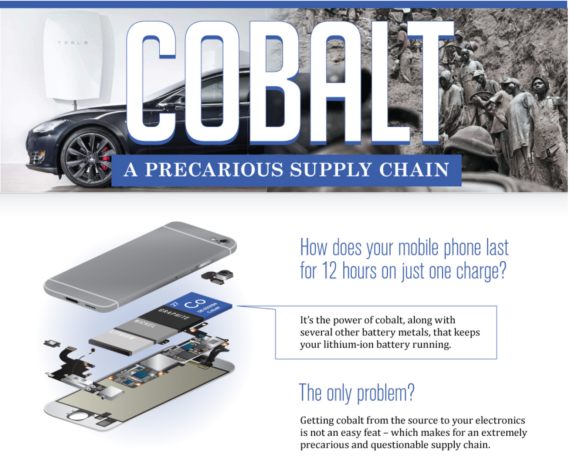 Wired calls cobalt the “blood diamond of batteries.” Companies like Apple and Samsung have joined the Chinese-driven Responsible Cobalt Initiative, pledging to address the worst environmental and social consequences of the supply chain and its consequences on child labor. Conversely, because many DRC mining companies and cobalt refineries are Chinese-owned, that country could develop a monopoly, which could box out other countries’ technology producers. Daniel Abraham from Argonne National Laboratory explains how cobalt comes into play in the lithium-ion battery. The need to develop batteries with greater storage capacity and faster charging times presses on EV manufacturers like Tesla and others. Panasonic is trying to sign contracts with clients “in a way that allows the company to hedge risks of surging prices of the materials,” said Yoshio Ito, the chief of Panasonic’s automotive business. Ito said Panasonic has been working closely with Tesla and preparing to increase production of battery cells as the US electric carmaker aims to boost production of the Model 3 sedan to 5,000 units a week by the end of June. In 2013, Tesla & Panasonic signed a historic lithium-ion battery cell agreement that expanded their 2011 agreement. 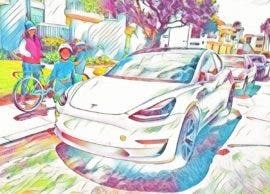 Just this week, at the Tesla annual shareholder meeting, Tesla CEO Elon Musk noted that, when the Model 3 achieves a 5,000 car/week production rate, Tesla will ship more battery capacity than in all other global EV shipments combined — and the Model 3 batteries will account for more battery capacity than in all non-Tesla EV shipped during the same period.